WESTLAKE VILLAGE, Calif., June 25 -- The midsize non-premium utility segment, which was once one of the largest segments in the new-vehicle industry and the source of substantial profits for several automakers, is dramatically declining, according to the Power Information Network (PIN), a division of J.D. Power and Associates. Share of the total new-vehicle market for this segment has dropped 43 percent since May 1997 to just 5.2 percent in May 2007. Sales volume for the midsize sport utility vehicle (SUV) segment has also dropped dramatically -- down nearly 18 percent (or 86,000 units) from the first five months of 2006 to just 402,272 for the same time period in 2007. Loyalty for the segment is also down considerably, as the percentage of midsize utility owners who trade in their vehicle for another of the same type has decreased from 29 percent in May 2004 to 17 percent in May 2007. 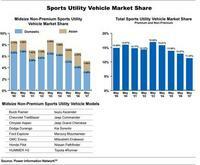 Midsize utility owners who leave the segment are increasingly migrating to crossover utility vehicles (CUV), with the percentage of owners who traded for a midsize crossover more than doubling from May 2004 to May 2007. The percentage of owners who traded for a compact crossover has increased from 6 percent in May 2004 to 11 percent in May 2007. "We can see the decline in this segment by looking at specific models like the Ford Explorer, which was the third-most-popular model in 1995, 1996 and 1998 in the United States," said Tom Libby, senior director of industry analysis at PIN. "But now, the Explorer ranks 46th through the first five months of this year, and there are no midsize utility models among the top 20 most popular vehicles in the country." Midsize utility owners are also trading to compact conventional cars, as the percentage of owners switching to this segment has climbed from 8 percent in May 2004 to 13 percent in May 2007. SUV owners are similarly moving to midsize conventional cars, with trades to this category increasing from 8 percent in May 2004 to 11 percent so far in 2007. 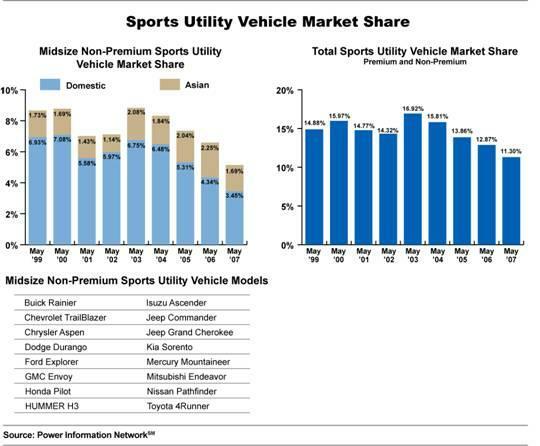 PIN data also indicate that as midsize utility owners leave the segment, manufacturers are gradually doing the same. The number of midsize utility models in the market peaked at 22 in 2003, 2004 and 2005. However, only 16 models make up the segment in 2007. "Clearly, consumers are responding to changing economic forces -- from rising energy costs to growing concerns about the environment -- and their preferences are driving the shift in design and vehicle attributes," said Jeff Schuster, executive director of automotive intelligence at J.D. Power and Associates. "Manufacturers are also responding to the changing environment by dramatically increasing the number of new products in the CUV segment to provide substitutes for midsize SUV models. This shift is far from over and will fundamentally change the mix of vehicles on the road in the years ahead." These loyalty, sales volume and market share declines have occurred despite particularly strong incentives from manufacturers. The average customer cash rebate for midsize utility vehicles increased from $2,642 during May 1 through June 10 of 2006 to $2,994 in the same time period in 2007. The percentage of midsize utility vehicles sold with a rebate also climbed from 56 percent in 2006 to 61 percent in 2007. Founded in 1888, The McGraw-Hill Companies is a leading global information services provider meeting worldwide needs in the financial services, education and business information markets through leading brands such as Standard & Poor's, McGraw-Hill Education, BusinessWeek and J.D. Power and Associates. The Corporation has more than 280 offices in 40 countries. Sales in 2006 were $6.3 billion. Additional information is available at http://www.mcgraw-hill.com/.